“My father was committed to human rights and devoted to the betterment of the human condition through education,” said the Rev. Will Brewster ’51, son of the founding head of school, for whom he is named. Called upon by the Rt. Rev. 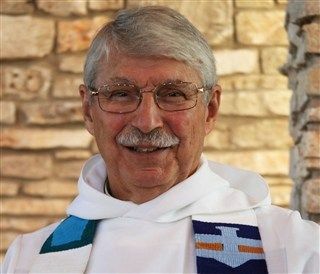 John E. Hines to establish an Episcopal boarding school in the West, the elder Brewster conceived of an inclusive church boarding school set high in the Texas hills that welcomed children of every economic and social group. “School-keeping,” as it was called, was expected of all community members, who were required to help maintain the property, work in the dining hall and clean the dorms. Brewster said school-keeping came to St. Stephen’s as part of his father’s DNA, based on his experiences school-keeping as a student at the Kent School in the early 1920s and his reaction to heading “pampered” students on the East Coast. The younger Brewster attended St. Stephen’s for one year, but said the time was “the most life-changing experience” of his life. He joined the U.S. Navy and served in the Pacific following the Korean War after graduating from St. Stephen’s and the University of Texas. He eventually “took up the family business,” becoming the fourth generation to wear the Episcopal collar. Although he now lives in Maine, Brewster returns to St. Stephen’s when he is able to speak in Chapel and honor his father’s memory. “I think my father would be astounded and delighted by the way the school has been built and rebuilt throughout the years and by the caliber of the students and teaching.